City of Cortland on behalf of the Cortland Fire Station, Cortland, NY. Cayuga County Arts Council (CCAC) on behalf of the Schine Theater, Auburn, NY. Gabriel & Heather Coleman on behalf of 610 Allen Street, Syracuse, NY. Crescent Commons, LLC (Housing Visions and David Yaman) on behalf of the Crescent Commons Project, Cortland, NY. The University Neighborhood Preservation Association, Crawford & Stearns Architects, and the Gustav Stickley House Foundation on behalf of the Gustav Stickley House, Syracuse, NY. The Montezuma Historical Society and the Town of Montezuma on behalf of the Montezuma Heritage Park, Montezuma, NY. The Howland Stone Store Museum on behalf of the Opendore Project, Sherwood, NY. 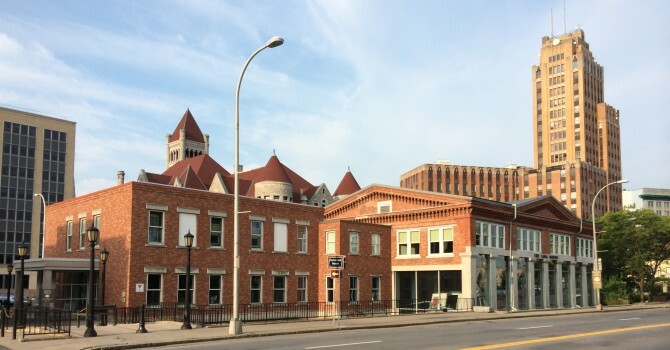 The Sutton Real Estate Company, LLC on behalf of the Harbor Street Lofts, Syracuse, NY. Murray Gould, for his faithful and energetic service to PACNY. The 2018 Awards will be presented at a formal ceremony with a reception to be held at 6 pm, Wednesday, October 17th, 2018 at the Erie Canal Museum in Syracuse, NY. Tickets are $20 for members, and $25 for non-members. To purchase tickets, please visit our website or make checks payable to PACNY and mail by Friday October 12th, to 930 James Street, Syracuse, NY, 13203. PACNY 2018 Awards – Call for Nominations! Nominations are closed. Thank you for your submissions and see you October 17th at the Erie Canal Museum! The Preservation Association of Central New York (PACNY) invites you to nominate an outstanding project, exceptional individual, or worthy organization to be recognized at PACNY’s 2018 Annual Awards Ceremony. All nominations will be reviewed by PACNY’s Awards Committee and award winners will ultimately be approved by PACNY’s Board of Directors. The 2018 Awards will be presented at a formal ceremony with a reception to be held on Wednesday, October 17, 2018 at the Erie Canal Museum in Syracuse, NY. The Jasena R. Foley Education Award is given to individuals or groups who educate, promote, engender or advocate a preservation ethic in CNY. The Paul Malo Award is given for projects that juxtapose old and new, demonstrating respect for our past while promoting our community’s future. The Preservation Merit Award is given in recognition of exceptional achievement in historic preservation. Stewardship Awards are given to individuals, organizations, or civic agencies that have maintained exceptionally high standards of care for historic properties or landscapes. The Wilma T. Auer Award honors volunteers who have made particularly outstanding contributions to PACNY. To nominate a project, individual, or organization for an award from PACNY, please complete an Awards Nomination Form found on our website at http://pacny.net/about-us/awards/ and provide all additional information requested in the Nomination Form. c/o Preservation Association of Central New York, Inc.
All nomination materials must be received by 5:00pm on Friday, August 24, 2018. Awards will be announced on Wednesday, September 5, 2018. We look forward to seeing you at our Awards Ceremony in October!